Ecological, water-based, hydrophobic protective coating for walls. Protects substrate from frost, salt water, condensation and airborne pollution. Does not change the appearance or reduce the permeability of the substrate. Totally reversible. 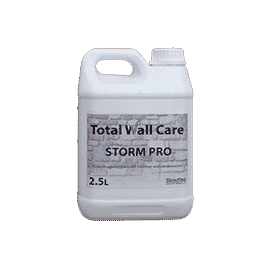 Total Wall Care Storm Pro is a protective, polysiloxane, water-repellent coating comprising of quaternary ammonium salts in aqueous solution with added biocide. It is ideal for waterproofing natural stone, marble, granite, soft limestone, compact limestone, sandstone, Lecce stone, Carparo stone, concrete. It creates an effective layer of protection, thereby reducing the ability of the external surfaces to trap atmospheric particles. It does not alter the appearance or permeability of the support it is applied to, and it is totally reversible. 0.1 – 0.4 l/m² depending on the porosity of the support.